Just today I accidentally deleted my Unread Folder and at first I thought I don't need it but an hour later I realize that it does help me so I decided to bring it back but there is no option in Outlook that can turn it on. After lurking the internet, I found a simple workaround to restore the Unread folder. 1. Under your mailbox, Right click Search Folders. 2. 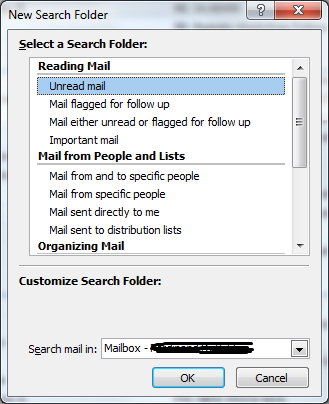 Select the Unread mail option then press OK.
3. A new Unread Mail folder is added on your Search Folder, Right click that folder and select "Add to Favorite Folder" from the pop-up menu to include it on your Favorites.